OK, we're jealous. When did you last hear of Baptist Bitter? Or Pentecostal Pilsener? Or even Lutheran Lager? Like, never. So if you're in search of a truly divine beer, you'll have to cross the denominational divides big time, and head off to He'brew for "the best (and only) Jewish beer in America". 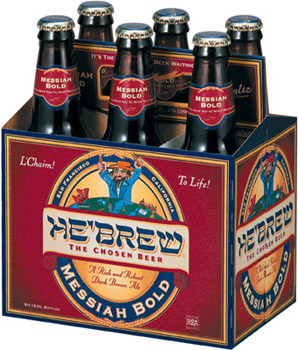 He'brew, "the chosen beer", offers a multitude of different brews. There's Genesis Ale; there's Messiah Bold ("the beer you've been waiting for", ha ha); there's Genesis 10:10 (brewed with pomegranate juice); there's Monumental Jewbelation, and there's even a beer in celebration of Jewish comedian Lenny Bruce. "This Chanukah, candles won't be the only thing getting lit!" says one of the brewery's many inspired sales blurbs. He'brew: a beer so blessed, you'll wish you were circumcised. Click here for the He'brew website.